UGC NET Exam 2018 - This is the most important exam for every student who are dreaming the career in teaching. There are many students who are preparing the UGC NET Exam 2018. But here we Commerce Update team Wants to share some Tips and Guidance for Makes Easy The UGC NET July exam 2018. For clear the exam of UGC NET You need to be Dedicate and Clear to the object and 100% input in preparing exam. 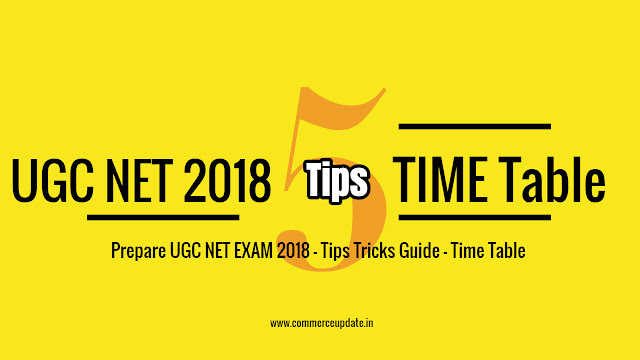 Here are some tips for Preparing the UGC NET Exam 2018. Best Thing of UGC NET Exam is that You do not have to face nagative marking in exam. so you can leave or attempt the question without any fear. So this is good to prepare the exam with proper timetable to attend the exam with proper Time management. -------- Suppose 1 Month is left for Final Exam. 4. Be dedicate and Focused - Put aside your mobile phones and Whatsapp chats and all things which distract the mind from study, be focused and Dedicate and give your 100% clear the exam.